Madoff Sentenced To Maximum 150 Years In Prison U.S. District Judge Denny Chin calls the scope of Bernard Madoff's fraud "staggering" as he delivers the most severe sentence allowed, ensuring the 71-year-old financier will live out his days behind bars. 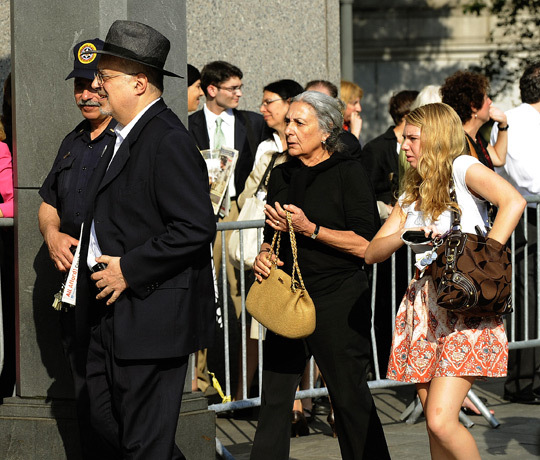 Hundreds of spectators and dozens of victims lined up outside the United States Courthouse in New York on Monday for the sentencing of disgraced financier Bernard Madoff. Convicted swindler Bernard Madoff was sentenced Monday to 150 years in prison for stealing billions of dollars from hundreds of investors over decades in one of the largest Ponzi schemes in history. U.S. District Judge Denny Chin called the scope of the fraud "staggering" and gave the 71-year-old financier the maximum sentence allowed, ensuring Madoff would live out his days behind bars. The probation department had recommended a 50-year term, while the defense lawyer had sought 12 years behind bars for his client. With the verdict, Chin said he was sending a message "that Mr. Madoff's crimes were extraordinarily evil, and that this kind of manipulation of the system is not just a bloodless crime that takes place on paper, but one instead that takes a staggering toll." Cheers and applause erupted from the gallery as Chin announced the verdict. Before the sentence was handed down, Madoff faced the wrath of nine of the hundreds of people he cheated in the fraud that wiped out fortunes large and small. Although he showed no emotion during their testimony, he did offer an apology to family and victims. "I dug myself deeper into a hole" as the scheme progressed, Madoff said, adding that he would "live with this pain, this torment, for the rest of my life." The victims who came forward testified that they had suffered financial ruin because of Madoff's fraud. "How could somebody do this to us? How could this be real? We did nothing wrong," said Dominic Ambrosino, a retired New York City corrections officer. "We will have to sell our home and hope to survive on Social Security alone." Tom Fitzmaurice accused Madoff of cheating his victims "so he and his wife, Ruth, could live a life of luxury beyond belief." Another victim, Michael Schwartz, told Madoff he wished a jail cell would be the disgraced financier's coffin. Madoff has already been ordered to forfeit assets worth more than $170 billion — the amount prosecutors say "flowed into the principal account to perpetrate the Ponzi scheme." The amount includes all his personal property, real estate, investments and $80 million in assets that his wife — who has not been charged — had claimed were hers. The order left her with $2.5 million. After the sentencing, Ruth Madoff said in a statement that she felt "betrayed and confused" by the actions of her husband. "The man who committed this horrible fraud is not the man whom I have known for all these years." She added: "Not a day goes by when I don't ache over the stories that I have heard and read." The exact amount of the fraud has yet to be calculated, largely because it was so vast and went on for so long. Weeks before Bernard Madoff's December arrest, statements showed that his firm had $56 billion in accounts. Madoff's case has become symbolic of Wall Street greed and a laissez-faire attitude toward federal oversight. Madoff, a former Nasdaq chairman, had earned a reputation as a trusted money manager with a track record of delivering stellar returns in good markets and bad. His clients — ranging from Florida retirees to celebrities such as Steven Spielberg, actor Kevin Bacon and Hall of Fame pitcher Sandy Koufax — consistently enjoyed steady double-digit returns. On March 12, Madoff pleaded guilty to securities fraud and other charges, saying he was "deeply sorry and ashamed." He insisted that he acted alone, describing a separate wholesale stock-trading firm run by his sons and brother as legitimate. Aside from an accountant accused of helping Madoff hide the scheme, no one else has been criminally charged. But family members as well as brokerages that recruited investors have come under intense scrutiny by the FBI, regulators and a court-appointed trustee overseeing the liquidation of Madoff's assets. In bankruptcy filings, trustee Irving Picard said family members "used customers' accounts as though they were their own," putting Madoff's maid, boat captain and house sitter in Florida on the company payroll and paying nearly $1 million in fees at high-end golf clubs in Florida and on Long Island, N.Y.
Picard has sought to reclaim ill-gotten gains by freezing Madoff's business bank accounts and selling off legitimate portions of his firm, Bernard L. Madoff Investment Securities LLC. (Its season tickets for the New York Mets went for $38,100.) He also is suing big money managers and investors for billions of dollars, claiming they were Madoff cronies who also cashed in on the fraud.